It’s guest post day here at Duct Tape Marketing, and today’s guest post is from Nicole Kohler – Enjoy! Gratitude can be a very powerful tactic for growing your customer base and increasing conversions on your website. When you express genuine emotion (including gratitude) to others online, you’re humanizing your brand – and making it easier for others to connect with you. Here are three ways you can harness the incredible power of gratitude in your marketing. A customer’s journey on your website doesn’t end when they click the “place order” or “submit form” button – or at least it shouldn’t. By creating a more actionable “thank you” page at the end of a transaction or form submission, you can strengthen your relationship with that visitor and have them take additional desirable actions. An explanation of what happens next (ex. when will they get their order? When will they hear from you? How can they contact you with questions? Something fun, humorous, or touching that will make your customer smile! Did your Facebook page reach 15,000 Likes? Is your Instagram account up to 1,000 followers? Now isn’t the time to be patting yourself on the back (well, okay, maybe just a little). Don’t forget: without your fans, none of this would be possible! When you reach important business milestones, try to find a way to thank your fans, followers, and customers. It could be as simple as posting a message of thanks, or sending a personalized “we appreciate your support” email. Or, if you operate an ecommerce store, you could celebrate by sending out a coupon or special discount code. As a small business, it’s important not to let the dedication of your fans go unnoticed, even as you continue to grow. Your customers will expect your acknowledgement and gratitude if you celebrate your early victories, so don’t forget about them as your wins get bigger! 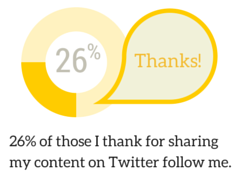 Sometimes writing an email or tweet to a customer just isn’t enough to express your thanks. If a customer does something really incredible for you – like writes a glowing blog post about you – you should respond in kind. Customers don’t always expect these “above and beyond” reactions – so by surprising them, you may delight them enough to strengthen your relationship with them, or convert them into a paying customer (if they aren’t one already). The next time you’re looking for a way to improve your marketing, think about using gratitude in one of the ways I’ve listed above. 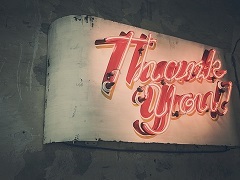 Saying “thank you” can have some unexpectedly powerful results! 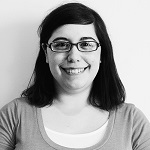 Nicole Kohler is the Web Content Strategist for WebpageFX, a full-service Internet marketing agency. When she’s not blogging, tweeting, or writing about marketing, she can be found playing video games, hanging out with her husband and pets, or enjoying a good piece of classic literature. Follow her on Twitter @nicoleckohler.